Vic Flick. You may not know the name but you have heard his guitar sound on film and television soundtracks and some of the most famous pop songs of all time. Vic plied his trade on ‘I Only Want To Be With You’, by Dusty Springfield, ‘Anyone Who Has A Heart’ by Cilla Black, ‘It’s Not Unusual’ by Tom Jones, ‘The Sun Ain’t Gonna Shine Anymore’ by The Walker Brothers, and Engelbert Humperdink’s ‘The Last Waltz’, amongst many, many others. Now for most musicians that would be a fine body of work in itself. But Vic has one more claim to fame. He was the man thwacking the strings on John Barry’s arrangement of Monty Norman’s James Bond Theme. The authorship of the James Bond Theme has always been controversial (and possibly litigious ground to step on), so we’ll leave that alone. But one thing is certain – It was Vic Flick on a Clifford Essex Paragon De Lux guitar that played that famous riff. 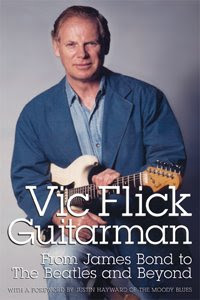 In 2008, Vic released his autobiography, ‘Vic Flick: Guitarman’. The book covers everything from his first tentative steps into the music industry, moving through the heady days of the British invasion of the mid to late ’60s, and the belated critical re-assessment of his work in recent years. Today I have the privilege of presenting an interview with Vic, where I ask him a few questions about his book, the work on the Bond series and some of the famous people he has shared studio floor with over the years. DF: I’m going to jump right out of the gate here and ask you about a section of the book that had me fully engaged and hungry to learn more. In your book you talk about being called into a recording session with Eric Clapton, who was working with composer Michael Kamen on the title track to License To Kill. What happened? VF: It was a phone call out of the blue. Michael Kamen wanted a dark guitar sound to compliment the melody and extemporization Eric Clapton was going to do on their composition. So, knowing of my penchant for low string guitar playing, he called me for the sessions. It was good to see Eric again after many years and it was wonderful to work with those two gifted musicians. Eric played some amazing guitar on the track and Michael worked out a fine arrangement. I did my thing with a counter theme in the low register. The title turned out very good and the following day we went to a loft in the wharf area of London to shoot the video. What little I saw of the video was great. The video was then submitted to the Bond producers who had commissioned the project. I waited, Michael waited and Eric was off doing his thing somewhere in the world. After two weeks came the news that the Bond producers wanted a song as a theme and commissioned Gladys Knight and the Pips and blew out the track that Michael, Eric and I submitted. I did well out of the sessions financially but would have like everyone to have heard and seen the video. That video is now the Holy Grail of Bond aficionados and he who finds it will see the golden light!! DF: So, to your knowledge, these recordings and video have never seen the light of day? VF: Again, no one knows where the video is. The one person who I thought knew, Michael Kamen, has since passed away so the secret has passed with him. DF: You have worked with quite a few people who are household names – especially for spy fans – names like Dusty Springfield, Tom Jones, Burt Bacharach, Henry Mancini, and the list goes on. You also worked with Shirley Bassey on a few occasions. What are your recollections of Shirley? VF: Shirley Bassey is an amazing artist. She gives her all when singing, both on stage and in the studio. She can be volatile with mood changes that happen within seconds. If anything goes wrong it will never be our Shirley’s fault – even if she misses an entry. In such a case the sound wasn’t correct or she thought she heard a musical mistake or she hadn’t said she was ready and so on. Everybody would sit with blank faces waiting for Shirley to come back to earth. Musical Directors have suffered at her hands, one of them having a nervous breakdown. DF: You also worked with Michael Legrand, who did the score for Never Say Never Again. You worked on Yentl, with Barbara Streisand. What were Legrand and Streisand like to work with? VF: It wasn’t a relationship that was made in Heaven even though both think that’s where they are a gift from. Certainly they are great talents but the person putting them together for Yentl, for instance, took a chance. DF: I am going to step away from spy film questions for a moment, and ask you about Brian Forbes’ Deadfall, which starred Michael Caine. The concert sequence, which is juxtaposed against a daring robbery, is looked back upon as a piece of bravura filmmaking. You had a hand in putting together that musical composition didn’t you? VF: John Barry was commissioned to write the score for Deadfall and he did a great job, catching the atmosphere of the film. However, the concerto featured classical guitar played by Renata Tarrago, a renowned classical guitarist. I got a call from John Barry asking me to go to his Villa in Spain where he had set up shop to write the music. He wanted some advice on the guitar part in the concerto. It finished up with me scoring the guitar part for Renata Tarrago to play. I was pleased, and at the same time dismayed, to read a review of the musical score applauding John Barry for his mastery of writing for guitar. That’s Show Business! DF: You worked on ‘Je t’aime…moi non plus’ with Jane Birkin and Serge Gainsbourg – that must have been a steamy recording session? DF: Last year, you released your autobiography, ‘Guitarman’ – a great read by the way – because you have played on so many ‘classic recordings’ was it hard to distill your anecdotes and reminisces down? VF: It was hard to leave out many anecdotes and I’m still thinking of more that I would have like to have included in the book. Maybe another book in the making! The book relates to such a busy time in the British music scene working on a multitude of recordings with so many artists in all the London studios that when I hear record on the radio or TV and even though I wasn’t on it, it sets up a chain of memories. Some of which I captured, others got away. DF: One thing I got from the book was a slice of what it was like to be a jobbing musician in the sixties. When we look back at the sixties, sometimes it seems like one giant psychedelic party, but your story seems to be one of hard work – traveling from gig to gig, or studio to studio. How did you avoid the traps that so many other musicians seemed to fall into – booze, drugs etc.? VF: This is a question I get asked a lot. I only ever tried pot once and it made me sick, Also, with the responsibilities of family and my reputation, I just couldn’t afford to get to a studio ‘out of it.’ Some guys did and were never seen again. DF: What would you say was the main reason for your longevity in an industry that is notoriously fickle? VF: Good question, David. I suppose it is a combination of my face fitting, being able to do what was required of me, turning up on time and, up until now, keeping my mouth shut. And not necessarily in that order! DF: And one final question if I may – this may seem silly to ask the man who played guitar on one of the most famous theme tunes of all time, but are you a Bond man, or a Bourne man? VF: Definitely a Bond man – and a Connery Bond man. DF: Oooh. Great answer. Thanks for taking the time to talk to me, Vic. Flick’s musical career originated at the tender age of age of fourteen, when he traded his piano lessons for acoustic guitar. Flick’s first major gig in the late 50’s was with an acoustic band that toured with Paul Anka, named the Bob Cort Skiffle Group. On the same tour with Paul Anka of the United Kingdom was the John Barry Seven, led by Oscar winning composer, John Barry. 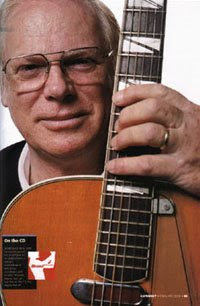 Months later, after a call from Barry, Flick joined the Seven, becoming the lead guitarist by 1958. Flick became a highly regarded session player, lending his masterful guitar skills to a variety of recordings and instrumental themes. Flick’s first memorable foray into film scoring was his work with composer Barry on the 1960’s cult film, Beat Girl. Some critics regard the score of this film, as the genesis for the Bond’s theme; as the slick title track of Beat Girl is reminiscent of pre-Bond emanations. From this moment, Flick’s contribution to the 60’s music scene was soon to become immense.